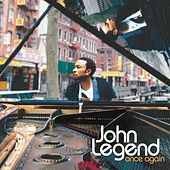 Last Sunday, 12th of November, after 7 hours of overtime work in the office, I went directly to a record bar to purchase John Legend's new album, Once Again. I became a fan of him since his song 'Ordinary People' which I used to sing a lot! Hehehe... Regarding the album, I love it! Really my type of music, R&B soul! His first single, 'Save Room' became an instant favorite of mine. Actually, as of writing, I have memorized it's lyrics. Upon listening on the album, I think that he pours so much of himself into each one of these songs, whether they're about flings with groupies or breakups with long-term girlfriends, that the album can begin to wear around the eighth track. The songs flit back and forth between easygoing, butterflies-of-love-type sentiments and deep drama, with both sides expressed through similar levels of intensity. It has full of emotions and a great musicality!